Interesting facts on the north pole – there is no land beneath the ice of the North Pole – only thick layer of ice. I was just wondering about the thicknees of the ice at the north pole. The sea depth at the North Pole has been measured at 4,261 metres (13,980 ft). The nearest land is usually said to be Kaffeklubben Island, off the northern coast of Greenland about 440 miles (c. 700 km) away. 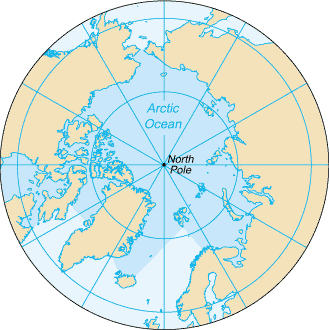 The north pole is often credited as having snow but it is factually snowless. The sea ice at the North Pole is typically around two or three meters thick, though there is considerable variation and occasionally the movement of floes exposes clear water. Studies have suggested that the average ice thickness has decreased in recent years due to global warming. The Arctic ice cap is a shifting pack of sea ice some 6.5 to 10 feet i.e. 2 to 3 meters thick – floating above the 13,000-foot-deep (4,000-meter-deep) Arctic Ocean. During the winter the Arctic ice pack grows to the size of the United States. In the summer half of the ice disappears.